*BEAN BOX SAMPLER GIFT SUBSCRIPTION: Every month Bean Box handpicks 4 gourmet dark roast coffees from Seattle's top small-batch roasters. Experience a wide variety of single origin coffees and artfully-crafted blends. 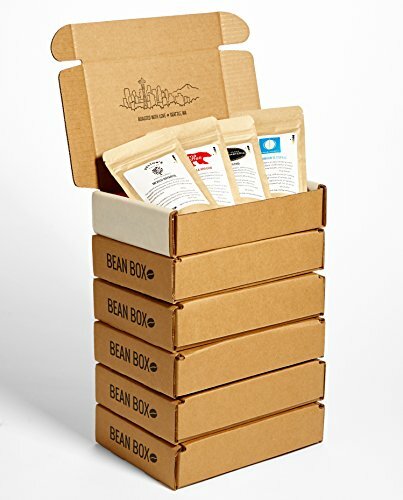 Every Bean Box includes nearly a half pound of freshly-roasted whole bean coffee, tasting notes, roaster profiles, brewing tips, and an artisan treat with free shipping. *GUARANTEED FRESHNESS: Every coffee we ship is roasted to your order. This means your cup is always filled with rich, delicious flavor. Many of our customers can't believe how great freshly-roasted coffee tastes. You don't have to travel to Seattle. We'll bring a gourmet coffee experience to the comfort of your kitchen. *SUPPORTING LOCAL ROASTERS: Buying a Bean Box supports a community of local artisan roasters. We work exclusively with 23 of Seattle's top-rated, award-winning, small batch-roasters, including: Kuma, Herkimer, Ladro, Slate, Bluebeard, True North, Velton, Broadcast, Conduit, Lighthouse, Middle Fork, Seattle Coffee Works, Zoka, and more. You can taste their focus on farm-to-cup sourcing and hand roasting in every cup. *GIFTS: Bean Box is the perfect gift for coffee lovers. Add a personalized gift note to your order. Whole bean coffee, tasting notes, and roaster profiles. If you have any questions about this product by Bean Box, contact us by completing and submitting the form below. If you are looking for a specif part number, please include it with your message.